The Tigers beat the Saints , last Friday night . It was their first win against them since 2003 . 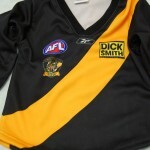 The Tiger army entertained the masses in their black and yellow football jumpers , jerseys , guernseys . The Saints , gallant in defeat , continue one of the great interclub rivalries . 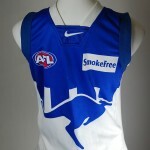 Saturday night saw the Melbourne Demons breakthrough for their first win of the Season , against the Essendon Bombers . Essendon coach James Hird's desperate coaching from the boundary wasn't enough to afford the Bombers a win . 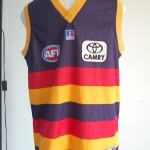 Relieved Demons supporters , are finally proud to show their colours , and are wearing their teams football jumpers , jerseys , guernseys , with pride . The Hawks rebounding from last weekends beating by the Tigers , thrashed the NMFC Kangaroos in a 104 point victory . A strong Adelaide side beat Freo , and the Power beat Carlton at home . Win , loss or draw AFL footy has provided a weekend of bruising action , close encounters , and thrills for fans . 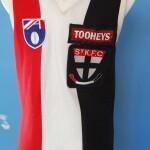 This entry was posted on Sunday, June 3rd, 2012 at 3:32 pm	and is filed under AFL, football jumpers, NRL. You can follow any responses to this entry through the RSS 2.0 feed. Both comments and pings are currently closed.